Vertical Spinning - Lazer Fishing Lures, metal lures for saltwater and freshwater fishing. When spinning, alter speed of retrieve to give the impression of the lure being a wounded bait fish and the predator fish thinking an easy catch. If trolling move rod forward and back, also alter the depth and speed. Try jigging by allowing lure to sink to bottom, raise rod quickly then let drop back again. Lure fishing is action fishing! Mention spinning and most lure fishermen immediately envisage lures working in a horizontal plane. Vertical presentations are usually regarded as the realm of jigging. Vertical spinning is a technique that is a hybrid of traditional, horizontal spinning techniques and deep water jigging. 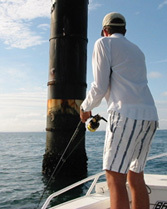 The origins of this technique are uncertain but it first gained attention twenty years ago in central Queensland being used to catch big Spanish mackerel on offshore reefs. The lures for those Spaniards were fairly hefty chunks of metal up to 100 grams or so. Since the vertical spinning concept became widely known it has been adapted to an host of different species in locations right around the country. Both tropical and temperate target species have proven responsive to this method of spinning. 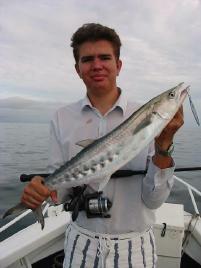 In Queensland this method has been very successfully adapted for use on most of the mackerel species , especially Spanish and school mackerel. It is also deadly on many of the trevally clan, commonly seen are giants, goldens, bludgers and bigeyes. Other tropical species that find vertical spinning to their liking include some of the better sportfish targets including queenfish, amberjack and cobia. In more southern climes likely captures can be any of the traditional spinning targets like tailor, salmon, silver trevally and of course the most esteemed of them all the yellowtail kingfish. All of the listed species as well as numerous other incidentals have been caught on Lazers in varying sizes.Vertical spinning is a shallow offshore waters technique most often used in depths from about 15metres to 30 metres. Anywhere that predatory fish hunt is a likely location for a spot of vertical spinning. Around the rocky shoreline of the southern coast where the bottom drops away steeply and around rocky islands are top spots for kingfish and silver trevally. The drop offs around reef complexes are excellent places to score Spanish mackerel, giant and bludger trevally and where there is a strong tidal flow, queenfish as well. Queenies seem to revel in fast moving water. The mechanics of the technique are not rocket science. Select your lure according to the depth of water, current flow and likely species. I most often use either 35gm, 50gm or 70gm lazers for species ranging from kingfish and trevally to amberjack, mackerel, queenfish, etc. Once the boat is in position slightly up current of the target area the lazer is dropped to the bottom in freefall. As soon as the lure touches down the retrieve is commenced, as fast as you can wind the reel handle. Don't worry, you cannot possibly wind so fast that a pelagic predator will be unable to catch that lazer. Species including school mackerel, and amberjack will often hit the lure as soon as it starts moving up from the bottom. Others like queenfish, spotted mackerel and, in some situations, yellowtail kingfish tend to hit the lure much closer to the surface, sometimes in full view of the angler. Fast retrieves give the appearance of a fleeing baitfish, triggering the chase response in most predators. Whilst jigging lazers will catch many reef species. This high-speed vertical spinning however is aimed purely at pelagic hunters. Equipment needs to be sturdy to cope with the rigors of prolonged tussles with what are often large, fast swimming fish. Large threadline reels built for saltwater use or high speed overheads should be mounted on rods that will take a knock without damage like the venerable Ugly Stik range. It is common when fish like amberjack or kingfish hit the lazer for them to pull the rod down so violently that it hits the gunwale. No room for thin walled high modulus graphite here. Likewise the lures themselves need to be able to take a hard knock and extreme punishment. In almost 20 years of using lazers to catch thousands of sport and gamefish I've never had one fail. Hook eyelets and towing eyelets simply do not pull out of these tooth proof lures. Lure colour can make the world of difference on fussy fish. Different species have different colour preferences so it pays to carry a range in the tackle box. Mackerel often favour silver/chrome, or pearl but we've had great success with the red head model. Amberjack have shown a preference for pink and some of the trevallies often climb all over green. A sounder is an essential item in a lot of subtropical locations where fish are thinly distributed enough to make pinpoint boat positioning necessary for success. To quote a well known ex football player, "its no use fishing where the fish ain't". Once fish are tracing on the sounder screen the lures can go over the side with a good chance of success. Maintain contact with the lure while it is sinking. School mackerel have a nasty habit of hitting lazers while they are fluttering downwards. That might sound OK but, if you have slack line while the lure sinks you will often be bitten off before you know you've had a strike. Luckily there are plenty of permanent fish attracting areas where those without a sounder can still score with some regularity. Most of the large bays and harbours around our coastline have at least a few navigation markers that will attract fish. Substantial structures close to deep water are often the best with those huge pylon types being reliable in many areas. Particularly attracted to these channel markers are kingfish, amberjack, school mackerel and several species of trevally. Whether you fish Sydney Harbour, Port Phillip Bay, Moreton Bay, Townsville Harbour, Weipa, Darwin Harbour or any other major port you'll find plenty of action by vertical spinning with lazers.